Hand made gnocchi served with a cherry tomato sauce, mozzarella and fresh basil. Dice the mozzarella. Chop the basil leaves. Wash and quarter the cherry tomatoes. Peel and dice the shallot. Heat a frying pan and add a drizzle of olive oil. Add the shallots and a pinch of salt and soften for 2 minutes. Add a sprig of thyme, a clove or garlic and the tomatoes to the pan. Cook for 5 to 10 minutes to obtain a tomato sauce. Cook the potatoes (skin on and whole) in a pan of boiling salted water. Once cooked drain, peel and puree the potatoes. Add the egg, 3/4 of the flour, salt and pepper and mix well. Form individual gnocchi about 2cm thick and roll through the rest of the flour to dust. 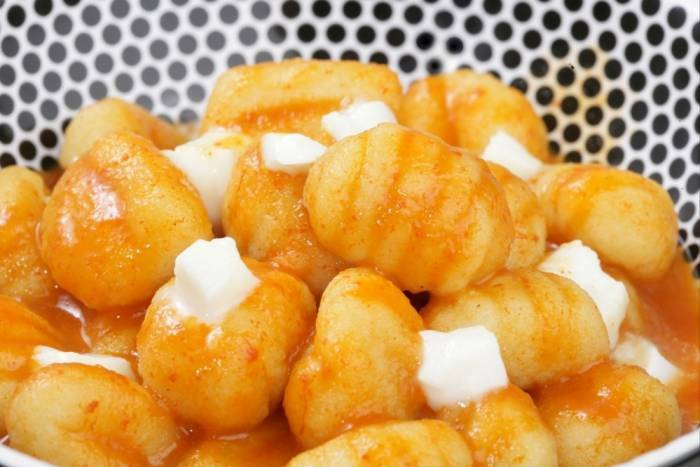 Cook the gnocchi in boiling salted water for 2 mins (until the gnocchi rise to the surface). Drain the gnocchi then stir through the tomato sauce. Serve the gnocchi in deep plates or soup bowls, garnish with mozzarella and fresh basil. Fnish with a little freshly ground pepper and serve.